See this video on "Teeth brushing techniques"! //www.youtube.com/watch?v=GKBU9qCSsLk&feature=youtu.be Teeth brushing for cats and dogs is logical, reasonable and can be performed easily. Thoughts create perceptions and realities. If you think you can brush your pets' teeth, you can with patience and practice. It actually becomes an enjoyable routine. If you never brushed your teeth, would your breath smell bad? How would this make you feel? Recent research in human medicine has shown that poor dental hygiene is a risk factor for heart attack. Teeth Brushing for pets can help avoid periodontal disease and other health problems! Research in veterinary medicine has shown that periodontal disease can spread to the heart, kidney and liver and create significant problems. You can play an active role in disease prevention by brushing your pets' teeth. Teeth brushing for pets can be fun, it can help prevent and control painful periodontal disease, it reduces bad breath problems, and helps avoid other health risks. Teeth brushing for pets can save owner's money! By brushing your pets' teeth daily, you can also save money. Teeth brushing reduces the frequency required for professional teeth cleaning and related services. Read more about COHAT, or comprehensive oral health assessment and treatment. How frequently do you brush your pets' teeth? Teeth brushing for pets, like many other important activities, must be performed routinely. This repetition creates a very beneficial habit. Daily teeth brushing is best because it physically removes plaque bacteria that causes periodontal disease. After three days, dental plaque hardens to form calculus or tartar. You cannot brush calculus away, and plaque bacteria hide under the calculus resulting in periodontal disease. Teeth brushnig technique for cats and dogs! The periodontal disease link demonstrates handy tooth brushes for pets and demonstrates the teeth brushing technique with photos. Additional photos are below. A written step-by-step teeth brushing technique is also available on this web site. We recommend you use this link to print the technique, and have it in plain view to help remember to brush your pet's teeth daily. Teeth brushing is worth the effort! Demonstration of a "finger brush"
is mounted on the finger. 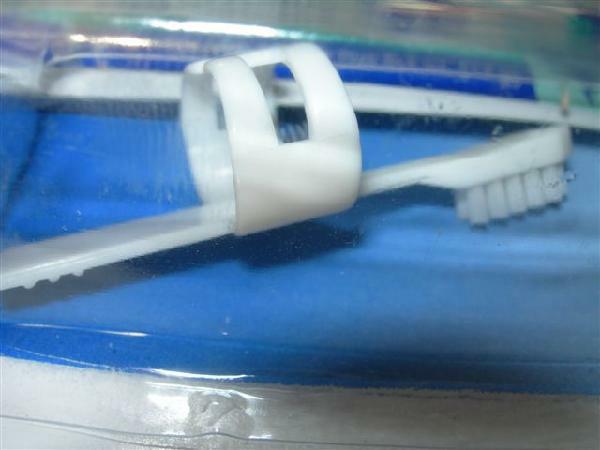 with finger brushes with rubber or plastic protrusions. and elliptical brush strokes are used here. Remember 45 degree angle to the gumline. Why don't we brush the inside (tongue side) of the teeth? Teeth brushing can be challenging or fun for both pets and their owners. Efforts to brush the inside of the teeth increases the challenge significantly. These efforts may lead to frustration and rejection of teeth brushing all together. Tongue motions seem to be effective at reducing the plaque accumulations on the insides of the teeth. The major salivary ducts secrete saliva primarily on the outside areas of the teeth. Saliva adds chemicals that contribute to the formation of calculus (tartar). Calculus cannot be brushed away and a professional cleaning is then necessary. Brushing only the outsides of the teeth may not seem to be ideal, however, it has been very beneficial for pets and their owners. Brushing the outside of the teeth is far superior to no teeth brushing at all. What tooth brush is best to use for your pet? The best tooth brush is the one you will use every day. The brush must be appropriately sized for the pet and the owner. A wide selection of brushes are available. For people with arthritis or limited hand mobility, it can be very effective to use a battery operated rotary tooth brush. Many pets accept this form of brushing. It takes time and patience. Final advice for teeth brushing of your pets. 1. Think about the reason you are brushing your pet's teeth. To remove plaque bacteria that causes periodontal disease, a health threat. 2. Have a positive attitude. If you think you can do it you indeed can. Enjoy your pet and brush their teeth to interact with them. Treats can be rewards. It takes time and patience to create a habit. Enjoy the time with your pet. Be persistent, always gentle, kind and loving. 4. Start slow, be gentle, play a lot. Brush for 5-10 seconds in the 4 dental arches upper and lower left, then right side. 5. Expand the brushing to 30 seconds in each of the 4 dental arcades. 6. Don't miss a day for six weeks and a habit is formed.